Certification: our desk is certified with "BIFMA"accord with US office furniture standard, please be assured to buy.Multifunction: this desk can be used as computer desk,computer table,writing desk,office desk, training table, dining table, meeting table, exhibition table etc. 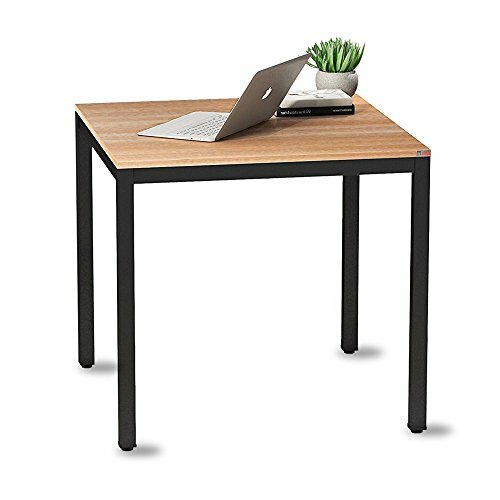 The table size: L = 31-1/2 '', H = 29-1/4 '', W = 15-3/4'', this small laptop desk can fit where you need it, and still provide enough table space for writing, reading, or working at your computer. It is a perfect addition to home offices, apartments, and college dorm rooms. Solid material: Thick 3/4" panel material is environmental E1 standard particle wood with glossy finish, waterproof and anti scratch. High Stability : Metal frame are all in 1.2mm thick, which is 1.3 times thicker than ordinary 0.8mm ones, it's more stable and solid than ordinary desk. Easy to assemble: The desk can be assembled in less than 15 minutes with all required tools included so you can spend more time on the important things in life - like relaxing with Family or watching the big game. PACKAGE:1*DESK, 8*SCREWS, 1*WRENCH. Certification: You no longer have to fear buying furniture online, our desk is certified with "BIFMA", accord with US office furniture standard, please be assured to buy. If you have any questions about this product by Need, contact us by completing and submitting the form below. If you are looking for a specif part number, please include it with your message.